In the past couple of years, the conversation of masculinity and what it really means has been a hot topic. Our society has begun to see a shift from a stereotypical “manly man” version of masculinity to a more softer and realistic version. To clarify, there is nothing wrong with being “soft.” Again, it is just another term our society has gone and given such a caged definition too. Now, what is emasculating about a man carrying his baby in a papoose? A papoose is just a pack-like carrier for infants. In all honesty, Morgan’s tweet is more emasculating than Craig’s act of great parenting. If anything Craig stepped up when his wife needed it the most. Craig’s daughter is only a month old, which means late nights and early mornings for the new parents. I can only imagine how tired the couple is and Craig using a papoose instead of making his wife use it is anything but emasculating. Now I’m curious as to what kind of father Morgan is to his four children because I’m not getting a great impression thus far. What does Morgan find so ridiculous about a papoose? They are a great way to keep your baby close to you and give them a better sense of comfort. His reasoning is because James Bond wouldn’t ever use one. Again, Morgan’s stream of thought is anything but logical, especially because James Bond is a fictional character. And, James Bond would totally wear one. If I’m being honest, this all seems like a way for Morgan to get in the headlines again. Because really when was the last time Morgan was relevant. I just wish it had been for something more positive and not ignorant. Other celebrities and Twitter users were quick to criticize Morgan and come to the aid of Craig. Talk about a great save by Captain America. Morgan needs to take a quick tip from Evans. Editor and author, Stig Abell, was also quick to fire back at Morgan. Both of these male celebrities brought up the idea that Morgan struggled with his own masculinity issues. In Craig’s defense, I can only imagine that with having a newborn baby that as parents you want to keep it close to you. For comfort, protection and it seems easier to carry than holding the baby. I don’t find that emasculating. Do you? If you do, we have a problem. Morgan’s “fix” to his obnoxious and outdated comment, being pied in the face on live tv. Still, Morgan couldn’t keep his mouth shut and had to add more fuel to the fire in a later tweet. 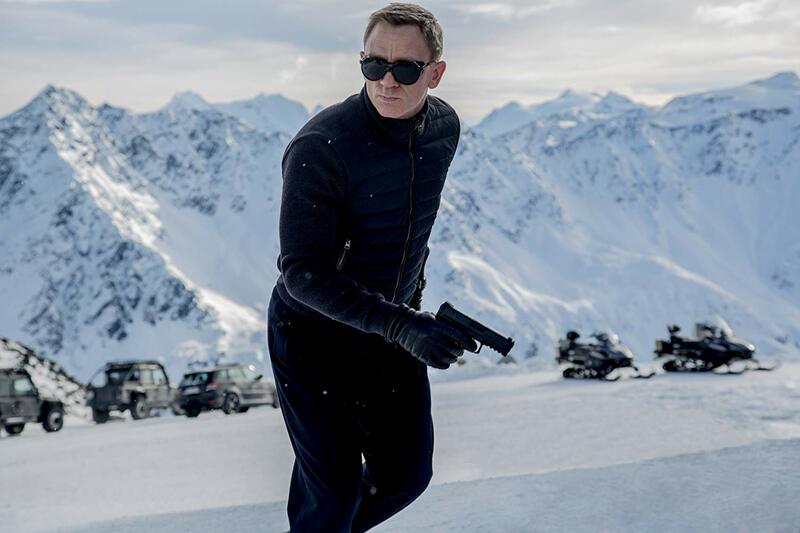 “BREAKING: James Bond ditches papoose.” The tweet included a picture of Craig holding his baby without a papoose. I mean can we — especially Morgan — just leave Craig alone. Just from the picture of him carrying his daughter in a papoose, I can get a sense that he is a great dad and I’m sure has no problems with masculinity. 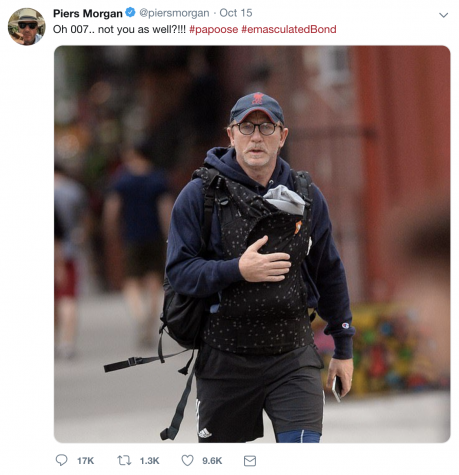 Morgan seems like the only male here with masculinity issues — not Craig or any other man that uses a papoose. Do you agree with Piers Morgan's tweet?